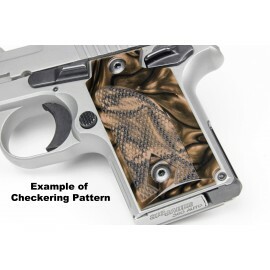 Sig Sauer P938 Grips There are 26 products in this category. 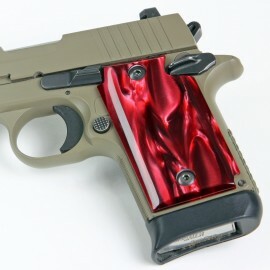 Fits : P938 RED PEARL Kirinite® Pistol Grips for Sig Sauer P938 Made from our revolutionary high-tech Kirinite®, these grips are as tough as they are beautiful. 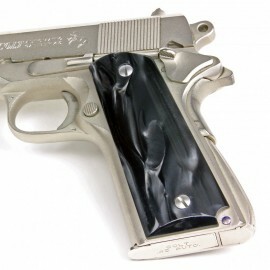 RED PEARL Kirinite® Pistol Grips for Sig Sauer P938 Made from our revolutionary high-tech Kirinite®, these grips are as tough as they are beautiful. 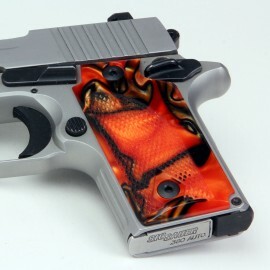 Fits : P938 Sig Sauer P938 BENGAL TIGER Kirinite® Pistol Grips Made from our revolutionary high-tech Kirinite®, these grips are as tough as they are beautiful. 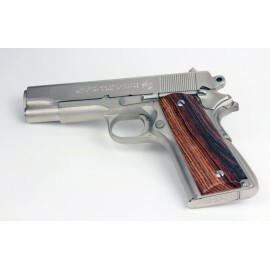 Sig Sauer P938 BENGAL TIGER Kirinite® Pistol Grips Made from our revolutionary high-tech Kirinite®, these grips are as tough as they are beautiful. Fits : P938 Sig Sauer P938 BLACK PEARL Kirinite® Pistol Grips Made from our revolutionary high-tech Kirinite®, these grips are as tough as they are beautiful. Sig Sauer P938 BLACK PEARL Kirinite® Pistol Grips Made from our revolutionary high-tech Kirinite®, these grips are as tough as they are beautiful. Fits : P938 Sig Sauer P938 Kirinite® Antique Pearl Grips Made from our revolutionary high-tech Kirinite®, these grips are as tough as they are beautiful. Sig Sauer P938 Kirinite® Antique Pearl Grips Made from our revolutionary high-tech Kirinite®, these grips are as tough as they are beautiful. 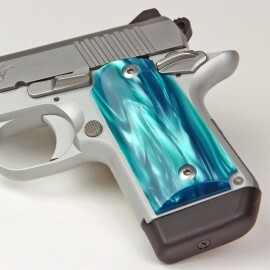 Fits : P938 Sig Sauer P938 Kirinite® Aqua Marine Grips Made from our revolutionary high-tech Kirinite®, these grips are as tough as they are beautiful. Sig Sauer P938 Kirinite® Aqua Marine Grips Made from our revolutionary high-tech Kirinite®, these grips are as tough as they are beautiful. Fits : P938 Sig Sauer P938 Kirinite® Atomic Pink Grips Made from our revolutionary high-tech Kirinite®, these grips are as tough as they are beautiful. 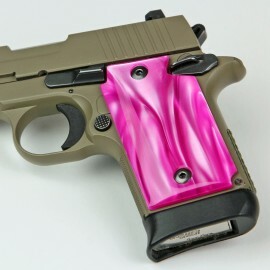 Sig Sauer P938 Kirinite® Atomic Pink Grips Made from our revolutionary high-tech Kirinite®, these grips are as tough as they are beautiful. 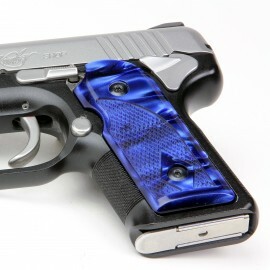 Fits : P938 Sig Sauer P938 Kirinite® Blue Pearl Grips Made from our revolutionary high-tech Kirinite®, these grips are as tough as they are beautiful. Sig Sauer P938 Kirinite® Blue Pearl Grips Made from our revolutionary high-tech Kirinite®, these grips are as tough as they are beautiful. Fits : P938 Sig Sauer P938 Kirinite® Cyclone Grips Made from our revolutionary high-tech Kirinite®, these grips are as tough as they are beautiful. Sig Sauer P938 Kirinite® Cyclone Grips Made from our revolutionary high-tech Kirinite®, these grips are as tough as they are beautiful. Fits : P938 Sig Sauer P938 Kirinite® Desert Camo Grips Made from our revolutionary high-tech Kirinite®, these grips are as tough as they are beautiful. 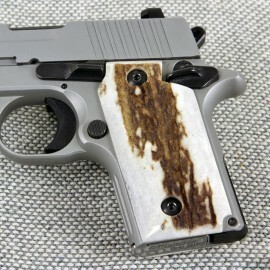 Sig Sauer P938 Kirinite® Desert Camo Grips Made from our revolutionary high-tech Kirinite®, these grips are as tough as they are beautiful. 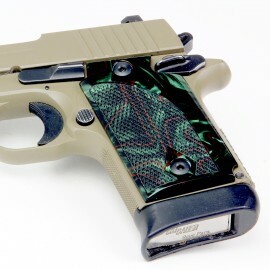 Fits : P938 Sig Sauer P938 Kirinite® Emerald Bay Grips Made from our revolutionary high-tech Kirinite®, these grips are as tough as they are beautiful. 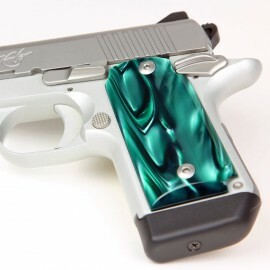 Sig Sauer P938 Kirinite® Emerald Bay Grips Made from our revolutionary high-tech Kirinite®, these grips are as tough as they are beautiful. 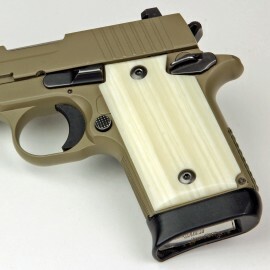 Fits : P938 Sig Sauer P938 Kirinite® Ivory Pistol Grips Made from our revolutionary high-tech Kirinite®, these grips are as tough as they are beautiful. 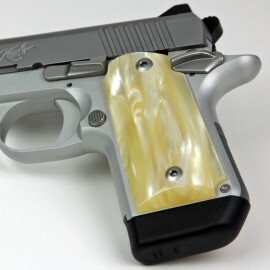 Sig Sauer P938 Kirinite® Ivory Pistol Grips Made from our revolutionary high-tech Kirinite®, these grips are as tough as they are beautiful. Fits : P938 Sig Sauer P938 Kirinite® Jungle Camo Grips Made from our revolutionary high-tech Kirinite®, these grips are as tough as they are beautiful. Sig Sauer P938 Kirinite® Jungle Camo Grips Made from our revolutionary high-tech Kirinite®, these grips are as tough as they are beautiful. Fits : P938 Sig Sauer P938 Kirinite® Liquid Gold Grips Made from our revolutionary high-tech Kirinite®, these grips are as tough as they are beautiful. Sig Sauer P938 Kirinite® Liquid Gold Grips Made from our revolutionary high-tech Kirinite®, these grips are as tough as they are beautiful.